Explore the Pacific and the Caribbean coastlines and take in the vistas of Volcano Arenal – on horseback in Costa Rica! The Costa Rica Coast to Coast Ride includes a coast explorations of both the Pacific and Caribbean Coast and in between a visit to Arenal Volcano – both a landmark and iconic feature which has become a highlight and a must in any Costa Rican itinerary. A mounted adventure that features 7 days of intensive riding and discovery of Costa Rica’s most scenic regions, including hugely contrasting landscapes, rural communities and awesome habitats with abundant wildlife. During this adventure you will be riding down dramatic river canyons, towards the arid Pacific Coast with its volcanic sand beaches, then on toward the Template Mountain slopes, passing through the forested Valleys and in between have some relaxation time enjoying the hot-spring waters of Arenal Volcano. And on the Caribbean you will experience not only a different coastline with exuberant lushness but a completely contrasting rich cultural experience! As you ride, you will be in close contact with one of nature’s finest panoramic displays, visit some quaint rural communities and get involved in the Costa Rican way of life... A truly awesome and unforgettable experience. Arrival at Juan Santamaría International Airport (SJO) in San José. Upon arrival you will be met by one of our representatives and transferred to your hotel near the airport. Overnight in San Jose. Morning transfer to Cien Fuegos Eco-Ranch & Stables, located along the Trinidad river in the Dry Central Pacific Region- the starting point of your riding adventure. After horse assignment and our presentation, you will head towards Hacienda La Maravilla, riding along rolling hills and meadows into the gallery forest alongside the Cuarros river – an excellent spot for wildlife encounters! We meander across the river following a country lane passing en route farmland, rural homes, and finally arriving at the hacienda grounds. This afternoon, there will be an exploratory ride following the private trails. The next three nights will be at Maravilla House lodge (shared bathrooms), whose remote location and attractive scenery will no doubt gives a better feel of typical Costa Rican life and living than anywhere else on the locations you will be visiting. Or, upgrade to the Cerro Lodge for private bath. Today’s ride will take you to the Pacific coast following country lanes and an old ranch trail which lead to Tivives Crag. The Spaniards first started their conquest of the Central Pacific around 1561 right from this very spot! Ride across the Cascajalillo Mangrove Swamps and along the coast. Depending on tide times, lunch will be served at a local café or as a picnic on the beach or back at Maravilla. Again, depending on the tide you climb on horseback towards Cuevas Crag, enjoying unique views of the Pacific Ocean or alternatively, ride along the shoreline towards Guacalillo beach. Follow a country lane back to hacienda Maravilla. This morning you have an exploratory ride of the hacienda’s 1000 acres and its private reserve, riding through rolling hills and savannahs towards the transitional-dry forest and the lush gallery forest. Here, the terrain is picturesque, predominantly flat with gentle slopes and forested valleys. As you ride over the higher areas you will be able to gain excellent views of the Pacific Ocean and perhaps spot some of the local area’s wildlife too. Back at the hacienda in time for lunch and relaxation. This afternoon there will be an optional ride in the Southern part of La Maravilla Hacienda. After a few gentle hill climbs you may experience an Ocean view sunset – the Pacific coast has the reputation for being amongst the world’s top best places to experience this beautiful event. Your final ride in the Central Pacific will take you to the Machuca River basin. Passing Cascajal village, you will ride into the area where this river canyon broadens onto the plains. Heading towards the Jesús María River basin, allowing exploration of the plains and forested valleys along the Machuca River Canyon where the land is very fertile and most commonly used to cultivate melons. Afternoon you will take a 3 1/2-hour transfer by vehicle to the Northern Region home to Arenal Volcano which last erupted in 1968 and remains one of the most active volcanoes in the world. Overnight in Arenal. This morning we will do the Don Tobias horse ride, a 3-hour horseback adventure through the Arenal countryside. The tour ascends a mountain as it traverses both rainforest and cattle fields. On your way up, you’ll stop at a beautiful lagoon where the horses will refresh themselves and you’ll be given time to stretch and look around. Continuing on, you’ll come to a lookout with marvelous views of the Arenal Volcano. This trail mainly covers private property, and was initially used by Don Tobias, a well-known horse breeder in the Arenal area. Afternoon guided visit to Arenal volcano and enjoy free time at the beautiful Arenal hot water springs and gardens - an excellent complementation to your riding adventure! These thermo-mineral waters, which some people claim to have healing powers, will help you to leave feeling relaxed! Overnight in Arenal. Early morning pick-up around 6:00am for a 5-hour regular shuttle transfer (shared basis) to the Caribbean Coast. After checking in your room and some free time to unwind, this afternoon there will be a briefing about our new set of horses. After horses are allocated, we will do an exploratory ride of on the Caribbean Coast in order to get acquainted with your new horse. You will take a brief walk following a jungle trail and then do some coastal riding, with opportunities for longer relaxing trails at a walk, trot, or a breathtaking canter. A stop for swimming and resting on the beach is usually included. Overnight in Cahuita. This morning you will take as short walk to the horse stables and ride over the scenic Playa Negra (Black Beach), then partway over the village road towards Playa Grande (Long Beach) – a secluded, quiet and deserted Caribbean beach which is ideal for horseback riding and a nice brisk canters. You will then enter into a beautiful tropical forest, where you may be able to spot howler monkeys, sloths, and a variety of exotic birds such as Toucans. Your knowledgeable guide will introduce you to the local flora and fauna. During one of the rest stops while the horses rest in the shade of a tree, your guide may display his coconut pealing technics using machete! On the way back there are again several nice opportunities for stretched-out canters. On the way back to the lodge you may stop to see some nice local artisans and souvenir shops, and have an excellent Caribbean lunch at one of the local restaurants. Afternoon at leisure to take any local excursions or rent a bike or surfboard (at an extra cost). Overnight in Cahuita. After enjoying breakfast, take as short walk to the horse stables. You will do a mountain trail ride, first riding along the beach and then following a mountain trail through a local farm reaching the trail head. We get off our horses and do a 50-minute hike following a forest trail to the secluded and enchanting waterfall where we will swim and enjoy a picnic-style lunch before we hike back and ride back. You will be back to the lodge in time for a refreshing shower and to take your regular shuttle (shared basis) transfer back to San Jose (3 1/2 hours) for your last night stay in Costa Rica. Morning at your leisure and transferred to the Juan Santamaría International Airport (SJO) in time for your flight back home and we say our farewells. Keys: (B) Breakfast, (L) Lunch, (D) Dinner, (TG) Transfer Guide, (EG) Equestrian Guide, (LG) Local Horse Master/Guide. Important Note: This is a sample ride dossier, planned several months in advance. The ride can be operated in different order other than as described above. Arrangements (routes or facilities) are subject to variation by the outfitter depending on local conditions. All riding times contained in our itineraries are based upon riding at a slow/moderate pace throughout. Horses: Costa Rican Criollo, Paso, and mixed breeds (Spanish, Andalusian & American Quarter). Pace: Moderate with trots, canters, and some gallops. 4-6 riding hours per day. This package has 7 riding days. This ride is designed for serious riders who want to discover the most complete possible grounds and scenery. This is achieved by using vehicle transportation (anywhere from 1-5 hours) only when strictly necessary due to the long distances involved between the 3 riding bases. Riders are required to have an intermediate level of riding experience to attend this ride. 8 days with an average of 4-6 hours per day. Costa Rican Criollo, Paso, and mixed breeds (Spanish, Andalusian & American Quarter). They range from 14 to 16 hands. Almost ideal year-round for visitors, the climate is moderate up in the highlands, whilst at the lowlands and coastal areas can range from the low 70's to the high 90's degrees Fahrenheit. The heaviest rainfalls usually occur in September and October. - Comfortable clothes of a light material, preferably cotton. T-shirts and shorts are acceptable in San José (during the day, if planning to go out in the evening trousers are highly recommended as some restaurants will not admit you in shorts or sandals). - Sturdy shoes or hiking boots are essential if you plan to do a lot of sightseeing and hiking. - Waterproof hiking sandals or other footwear that lets your feet breathe are good for strolling about town, and also for beach walking, fording streams, and navigating the myriad mud holes you'll find on rain forest and cloud forest trails. - Any medication you may require, please consult with your G.P. for health advise. The tone here is casual wear - it is not necessary to dress up to go to dinner. Comfortable lightweight is best. In the higher elevations, San Jose, the volcanoes, or Monteverde, temperatures are cool and sweaters or light jackets are suggested. We recommend for women to ride in leggings with a big shirt over them. The leggings are not too hot, and they dry out quickly if they get wet. Almost all encounters with noxious insects & plants can be avoided by watching where you walk and sit, by not touching non-recognizable insects, plants, etc. by tucking pants in your socks, by using an insect repellent, by spraying shoes and ankles to avoid bites, by always following tour guide's instructions to the letter, and finally, avoid using perfumes, after-shave, or other scents that will attract insects. Please leave your valuables at home. This is a progressive ride, so nights will be spent in different locations. A total of 2 nights will be spent at a hotel in San Jose, 3 nights at a farm lodge, 2 nights at an ecolodge, and 2 nights at a rustic cabana. You'll have access to a pool or the ocean at all locations to cool off after a good ride. The accommodations below are usually used during this trip. However, changes may occur without notice, based on availability at the time. Laundry is not available for this trip. This hotel located within walking distance of San Jose’s city center offers 117 comfortable rooms with amenities including air conditioning, WIFI, and TV. The private bathrooms all include free toiletries. An outdoor swimming pool, a hot tub, and fitness center are available for guests’ use. The lodge is part of an estate that encompasses over 1500 acres (a working cattle and plantation Hacienda) which includes its own protected zone (Cuarros) with Premontane and Transitional Forests amongst many other unique features, making this one of our top horse riding locations. Accommodation is in a typically large family owned hacienda house with traditional wood finishing touches. It has 4 spacious bedrooms located at the corners of the Hacienda house with a hallway in between. Each rooms is wall-to-wall tiled with painted murals, with twin single beds, ceiling fan, fitted closet, wooden ceilings, and has country decorations including two wooden tables, local crafts, and lamps. There is one spacious tiled hot-water shower and bathroom for every two rooms. Facilities include: A large central hall, fully fitted kitchen, large twelve-seater 'ranch table' dining room. Outside there is a BBQ. There are hammocks along the outsides of the ranch house and mountain trails to explore on foot, as well as miles upon miles of mango plantations. Life at Maravilla Hacienda is friendly, relaxed and informal, get up at dawn and coffee and other drinks will be available to quietly welcome in the day. Even join the sabaneros (cowboys) in the morning milking if you have the mind to. 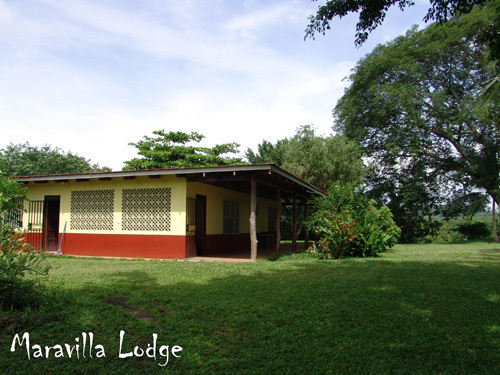 This lodge is an environmentally friendly project located on a farm in Tarcoles (central pacific) just 10 minutes from Carara National Park. This small lodge offers 8 bungalows with private bathroom and its own indoor garden, and a dining area. All this is surrounded by trees, palms, gardens, and panoramic views of the Pacific Ocean, mangrove forests, and Carara National Park - one of the most important refuges for the Scarlet Macaw; we often see these spectacular red, blue, and yellow parrots as they fly through the valley at Cerro Lodge. We provide daily transfers between the lodge and the horse stables at Maravilla (15 to 20 minutes away). 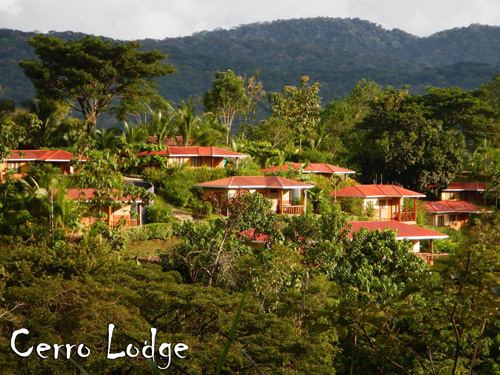 One of the principle goals of Cerro Lodge, is to operate as environmentally friendly and sustainable as possible. Always looking for ways to reduce impact, they re-use water for irrigation, compost organic garbage, and they have worms that make organic fertilizer from cow manure. They are also hoping to put together a bio-digestor and would like to produce their own electricity in the near future. 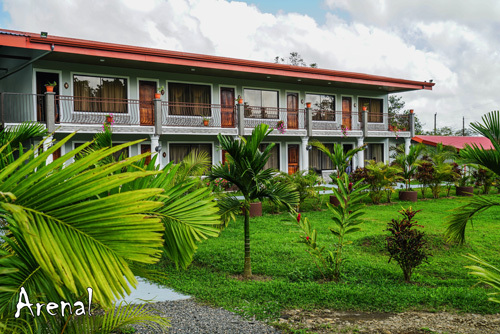 We choose from a selection of 3 different hotels in Arenal depending on availability. The photo above is an example of the type of accommodation, and may be changed. All rooms contain one double or two twin beds with private bathroom. We choose from a selection of different cabanas in Cahuita depending on availability. All rooms contain one double or two twin beds with private bathroom. There is also WIFI available. The single supplement fee applies if we are unable to find another rider to share. Triple occupancy is available at all locations. Most meals are included in this trip from breakfast on Day 2 to lunch on Day 9, as well as breakfast on Day 10. Meals on the first day and dinner on Day 9 are not included. Meals on the first day, dinner on Day 6, and lunch and dinner on Day 7 are not included. Due to its geographical location and climate, Costa Rica has a wide variety of fruits and vegetables; which when combined with the interplay of native and European ingredients translate into a unique Costa Rican flavour. The basics of the Costa Rican diet are: rice, beans, and tortillas, which consist primarily of corn. The ingredients used by Costa Rican cooks include simple native foods, such as "chayote" (squash), avocados, and the ever present corn. Costa Rican cuisine is also characterized by its' mildness and comes as a surprise to many visitors who might have travelled through Mexico and expect to find the same love spicy chillies in Costa Rican foods. Chillies are used to some degree, however, they are most commonly used in hot sauces with accompany broiled meats and poultry. Tubers, such as sweet potatoes and cassava, commonly known as "yucca" frequently accompany lunch and dinner meals. In many dishes yucca is often substituted for potato, perhaps boiled and mashed, fried to exquisite crispness to accompany meat and sandwiches instead of fries, or simply boiled and served with butter and garlic. Plantains, a type of banana, are another Costa Rican favourite, and are most often boiled, mashed, stuffed with cheese, or fried to accompany meats or bean dishes. Unlike bananas, plantains are much larger and need to be cooked to be eaten. Costa Rican diet also includes plenty of meats including: Poultry, fish, beef and pork.. do not expect to find any Ecuadorian or Peruvian delicacy!! A traditional Costa Rican breakfast consists of "gallo pinto" (Pinto Rooster), eggs, tortillas and sour cream, with coffee and fresh fruit juice. Most restaurants will offer some international options. Typically known as "casado" (Married), includes: rice and beans, one choice of meat (beef, chicken, pork, or fish), salad, fried plantain (a type of banana, very sweet and very tasty). Pretty much whatever you like, and fish and seafood here is excellent, well priced, and fresh, as are the fruits and vegetables. Of course Costa Rica produces some of the finest coffee in the world and it's not uncommon to see bumper stickers around proclaiming that "Juan Valdez drinks Costa Rican coffee"
We can cater to most dietary restrictions if given prior notice. Passport valid for at least 30 days after arrival or for the length of stay, whichever is greater. (a) Nationals listed above must obtain an exit visa from the Immigration Department in San José at least three weeks before leaving Costa Rica. Those who stay for less than 30 days are exempt if in possession of a disembarkation card. (b) 2. nationals of Australia, Bulgaria and Ireland for stays over 30 days. The immigration authorities are strict about detaining foreigners who are undocumented or tourists who have overstayed.